The William T. Stearn Student Essay Prize has been instituted in honour of the late William T. Stearn, a scholar whose work contributed much to the field and to this Society. The Society for the History of Natural History invites submissions to the 2019 William T. Stearn Student Essay Prize Competition. The prize will be awarded to the best original, unpublished, essay in the field of history of natural history. The submission deadline is 30 July 2019. The competition is open to undergraduate and postgraduate students in full or part-time education. Entry is not limited to members of SHNH. Entries will be considered by a panel of three judges appointed by the Council of the Society. The winner will receive £300 and be offered membership of the Society for one year. 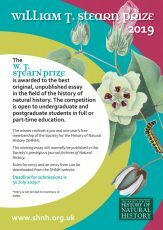 The winning essay will normally be published in the Society’s journal Archives of Natural History. The Prize Rules and Application Form are available for download as an Adobe Acrobat (PDF) files. Entries must be prepared in conformity with the bibliographic conventions of Archives of Natural History, in ‘Guidelines for Authors’. Carissa Chew. University of Edinburgh. Orientalism and the ant: empire, race and myrmecology.